We have announced our second weekend of the Night without Light dinner. May 14, 15 and 16. Times TBD, depending on our responses. Please email anightwithoutlight@gmail.com if you would like to reserve your seats. Again, this is our thank you for your kind, minimum $20 donation towards VisionWalk. Don't miss out on a very unique, experience. The below is from one of our guests after he attended the dinner. "I will never truly know what it's like to live in Gavin's world, I did leave with a whole NEW perspective on how important sight is to soo many of lifes everyday tasks. I managed to "feel" my way through dinner, but at the same time I couldn't help but realize that I had a distinct advantage having learned this routine over the course of my life with sight. The most influential moment of the evening for me was seeing that huge smile on Gavin's face when our lights came back on and the realization that he is always in darkness struck me even harder than before. For me, regardless of what can be perceive as a disability to him, I felt comfort knowing that he lives just as happily in the only world he knows, smiling and responding to the voices, words and sounds that create his perspective, just in a very different way than ours. "- Gary C.
Those are just a few commands coming from Gavin's mouth while he is still trying to wake up. We wake up to this every morning, and me and Troy just look at each other and laugh. It's funny, but at the same time, at 3 am it's exhausting! Hearing that little voice coming from his room is about the sweetest thing I hear everyday, we wake up to it every morning, and there is no way it can't not bring a smile to your face, regardless how early it is. Gavin's strengths has always been his vocabulary and ability to repeat your words with comprehension. He's been really talking before he was one year old. 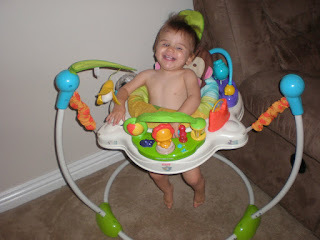 Now at 18 months old, we have full on conversations, and he has entered the "NO" phase which can drive you bananas. It's a long drawn out, but yet stern "NO". Kind of like he is trying to be polite, but yet firm. It's entertaining, but I hear it non-stop, especially now when his teachers do their home visits. I know this is another phase of many. The part where I am going with this, is Gavin does a lot of eye pressing when he is in his high chair eating. He can be perfectly content, happy and enjoying his food (especially if it's spaghetti), but almost like a soothing mechanism, one hand goes to do the eye pressing automatically. He does this also when he is playing, which he can be perfectly content, and one hand occupied and the other is in his eye. 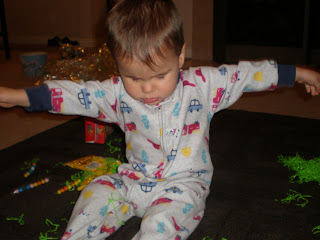 We have been discussing this with his OT/early intevention teacher, and we are going to try something. Give him lots of vestibular stimulation before dinner time. Normally, this is something we do anyways, but I am going to bring some more attention to it. When Troy gets home, if we aren't already outside playing, he takes the boys to ride bikes, and Gavin swings. Getting all 3 boys out while I make dinner is a big plus. This is already our everyday routine, but we are hoping this helps with the detouring of the eye pressing during dinner. We want to transition him to wanting to feed himself, but I think that is going to take some work. It's hard with one hand in the eye, and the other hand throwing everything off his plate. I am not worried about it, but this is yet another stage to get him through. Days when it is cold, rainy and we can't do the swing, we will be throwing him in his jumper, which he still LOVES at his age! We have had to anchor that thing down by putting part of it under the couch, so he can't tip. He is so strong, and he doesn't just jump and down, he rocks back and forth, does his side-to-side song, he spins around, etc. All different ways to get different types of vestibular stimulation. I will keep you posted on how this works for us, and if our theory with more VS will help with the dinner time poking. In the meantime, he will continue to use his commands to drive this momma nuts! 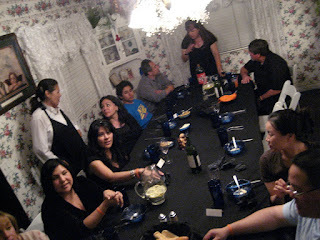 The weekend of our own version of Dinner in the Dark, could not have been better. It took a lot of work, a lot of cooking, a lot of last minute running around, but all in all (thanks to my family) it was an incredible event! 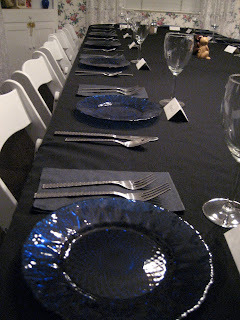 Approximately 80 guests in total were served in total darkness. It took some tweeks and lots of thinking and hard work to get the windows covered properly to keep out the light, but we did it. We also had our "holding" areas that was also completely keeping out the light, so those running the food to our two servers, there would not be any light leaks in all the transition. Before I go any further, and you are in the area, would you PLEASE consider coming? It's not even about the $20 donation towards VisionWalk, it's the experience. I cannot put into words the feeling I had after each and every guest walked out of the room, finishing their meal in the dark. 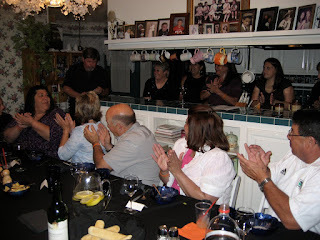 There were tears, there were smiles, hugs and overall a new gratitude towards our senses. I have countless emails thanking us for allowing our guests to be a part of such a remarkable, once in a lifetime experience. Would you please, please consider having a night out with great dinner, for a great cause and join us for our next Night without Light? I can surely promise you a night you will forever remember! You can try our signature Sunset cocktail that my cousin Joanna came up with. 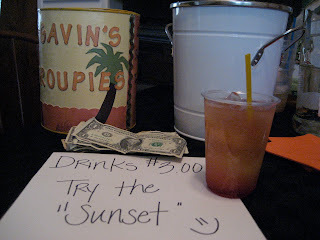 We wanted something to coincide with our "Sunset" theme and color of Gavin's Groupies. It was DELICIOUS! When you join us next time (don't you just like that subtleness), you can expect the following to happen. You will be greeted as you walk up, be given your Gavin's Groupies wristband as well as a program. You will be escorted through the door to our "bar". Here is where my cousin Joanna will make you a Sunset (or drink of choice). 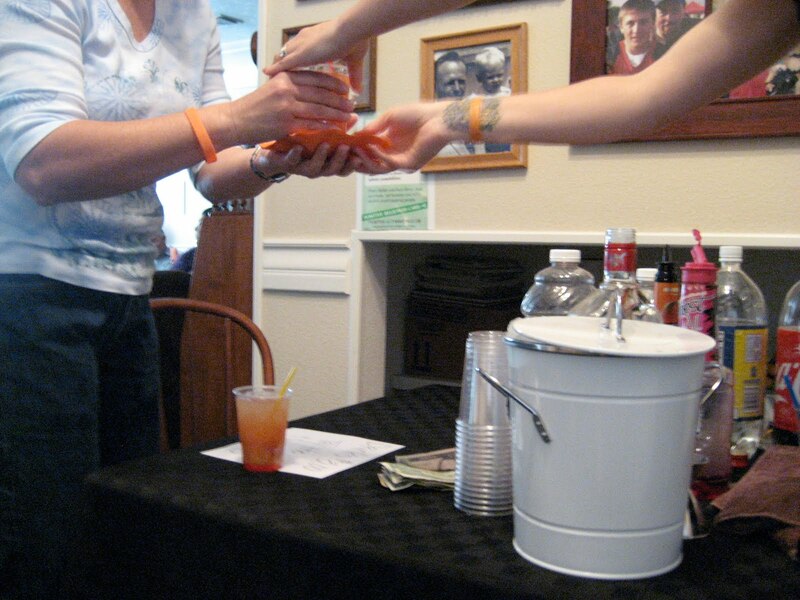 These drinks are for an additional $3, everything else is included in your donation. We have about a 30 minute waiting period to make sure everyone arrives and during this time, you can mingle, look at all our Gavin's Groupies pictures on photo boards of all our past events, and of course enjoy your cocktail. Troy is a great public speaker, and so he was nominated to talk to our guests for a few minutes during this 30 minute informative period. We informed people about what to expect during the experience, we talked about Vision Walk and where the donation is going towards, as well as an overview of Gavin's disease and blindness in general. You will then be escorted to the dining area, in the light. All lights are on at this time. 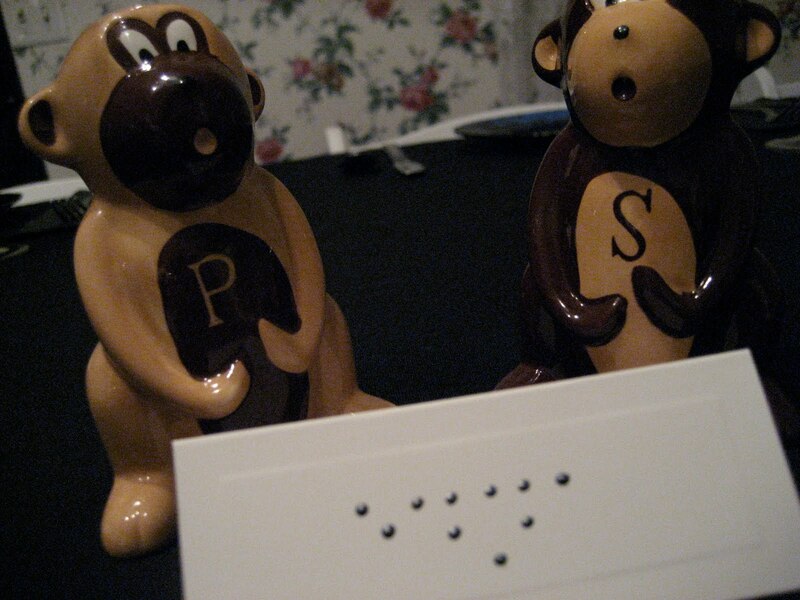 Your seating cards are on the table, one side printed the other your name written in braille. We serve you with your soda, water and choice of red or white wine. We also have the salads out on your plate, and you can choose your dressing. Although this is an advantage, we wanted people to be comfortable, because it is an uneasy experience to some. Once everyone is situated, we turn the lights off for about 15 seconds to give you a glimpse of what pitch black is, and the feeling that you will have that you are not in control of the darkness. 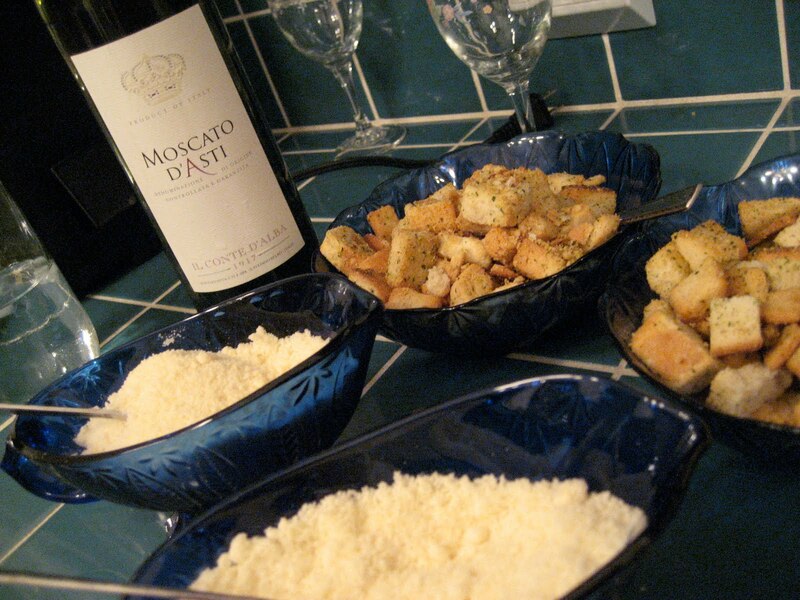 Once everyone is ok with it, we turn the lights off and the feast begins! 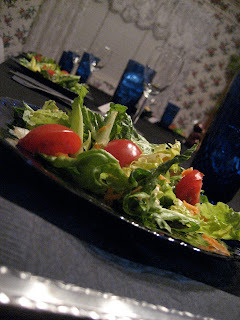 First we start with the salads, then we bring in the main course, and once everyone is done, we will serve the dessert. This is all done in the dark, no lights, no candlelight, no glimpse of your hand in front of you. The servers wear night vision goggles, and you are responsible for filling up your glasses should you want more wine, water, etc. All the while, about 10 family members are working to make sure everything is going smoothly. It definitely is a project in itself to accomodate everyone in the dark. But we did it! It went so smoothly, and I am so proud of us for such an accomplishment! It really is a remarkable experience! We wanted it to be an enjoyable experience as well, and our efforts paid off. With all our thank you's we received and hugs and tears of support, you, our guests were really who I should be thanking. You will be walking away with being in my son's world for 35 minutes of your life, and your interest in our cause really gets me choked up. I am so thankful for all you have done to help us move forward. I am inspired by you guys! Thank you for wanting to walk in Gavin's shoes. I am humbled and honored to have helped in giving you this experience. Thank you to our first Night without Light guests! Irvine Lake Mud Run update with pictures! When something presents itself, it’s ok to just go with it. 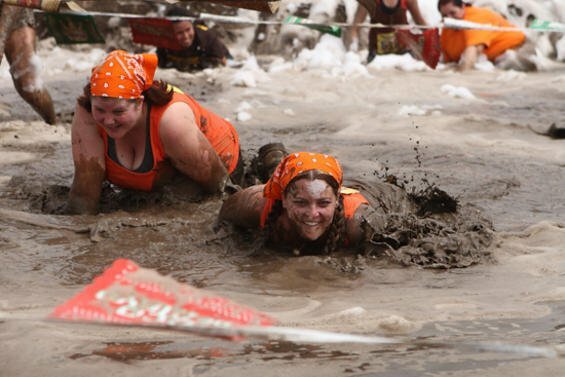 The Irvine Lake Mud Run, took place the weekend of April 10-11. This is a perfect example of that, just letting it happen. Gavin’s Groupies made the OC Register, OC weekly, MSNBC.com and this is something that was not planned necessarily! My lifelong friend from high school, John, asked me a few months ago if he could use Gavin’s Groupies as his team name for the mud run that he had been wanting to sign up for. Of course, I said sure. He signed up a four man team, named Gavin’s Groupies and all was fine. I thought, this would be a good way to promote for VisionWalk in June, he could wear his VW shirt from last year, and maybe one or two people would ask him what it was, etc. Promotion anyway you can get it, especially when it’s free and easy. I wasn’t even planning on going to the mud run, this was John’s thing and there was no reason other than us to cheer him on to go. 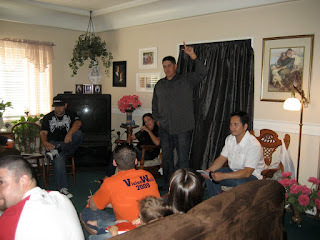 We had our Night without Light weekend event the following weekend, and had plans to tie up all the loose ends for that. Just when you think you have it all planned out, its not. I want to insert a big fat HAHA here. Because it is a little funny. A few weeks after the team was formed, John began telling me that “so and so” signed up, we were up to 20 people on the team, etc. Every week it seemed as though another 20 people were added. Needless to say, within 2 months, we had 180 people signed up under Gavin’s Groupies team. It turned out we continued recruiting and with a cause, since everyone was wondering what GG was all about. When they told their friends about the cause, then they jumped on board, and it was a complete snowball effect. WOW. 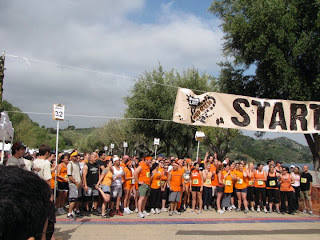 180 people, the largest team ever at the Irvine Lake Mud Run. They ended up giving us a booth, so this turned into a full on fundraising event. We had our staff of family working the booth, selling our T-shirts, wristbands and signing people up for our newsletter and VisionWalk, talking to people about the Foundation Fighting Blindness. We had our picture boards of all our past events, so people could see what we have done. 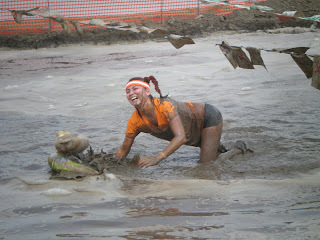 There was bright orange EVERYWHERE! People from high school, I have not seen in many many MANY years signed up. Old friends, new friends, family, friends of friends, strangers all coming together in the name of Gavin’s Groupies and to raise awareness of blindness. What a true blessing of a weekend. 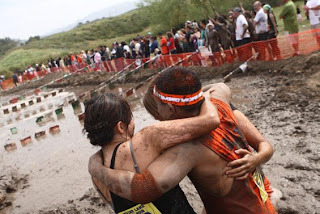 It is not something I could ever had imagined happening or even thinking of a mud run being so impactful? When you hear one hundred and eighty people, in your mind you think “That is a lot of people!”. But when you see all of these people walk up in groups, individually, and the sea of orange it is really touching. 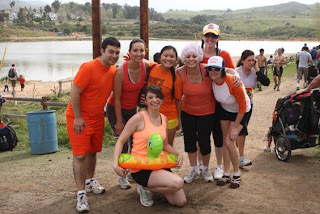 Yes, they are here for a good time, a mud run, but they joined our team to help us whether they knew what they were doing or not. I think once they all walked to the Start line, it hit everyone. 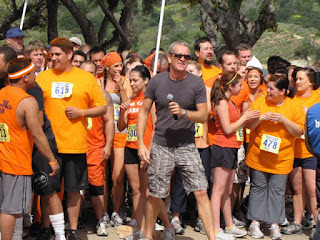 Richard Blade, formerly of KROQ was the DJ/announcer for the day. He was told of Gavin's Groupies team, and what our cause was, and why we were there, and how it all evolved. We had NO idea he was going to personally talk about Gavin, us (the family) and the thanks he gave to our runners for being there to support us and Gavin. He had the mic in hand, our ginormous team was at the START line with me, Troy, Landon and Gavin standing beside him and he brought me to tears. I mean I lost it! It was so touching, especially hearing him talk about Gavin, and our efforts. Here I am a babbling fool, trying to wipe the tears from under my sunglasses, and I glance out to our team all there for Gavin. I look back behind me, and seeing my family who helped us throughout the day standing there in tears waving to us. And I cry some more! WHAT A MOMENT! I keep replaying that to over and over, and still get chills. It was the most perfect moment without planning it. I will let the pictures tell the rest of the story. 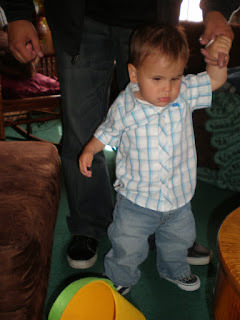 Click here for Gavin's Groupies on Facebook to see even more pictures! I am choosing to ignore my laundry pile that looks like Mt. Kilimanjaro and the fact that my feet stick to the tile in the kitchen to get some posts done. It's been a very crazy, hectic, can’t-catch-your-breath kind of few weeks. It’s a good busy, but adrenaline surged that’s for sure. I have never run on adrenaline for so long. It finally hit me the day after my speech (I will expand on this high blood pressure moment later), I was in bed by 7 with no dinner and at that point didn't care if I made dinner for the rest of my house (mom of the year for sure). haha! 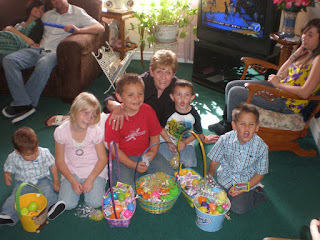 Here are some pics from Easter. 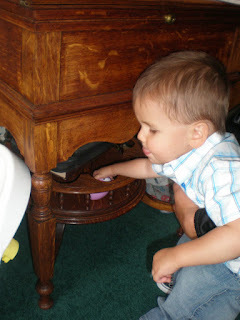 I wanted to make sure I got these up because these were the first time we had used the "Hide 'em and Find 'em Eggs". 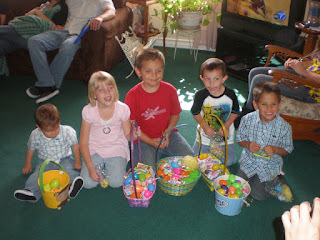 Gavin still is at little young, but I remember last Easter, all the little kiddies were running around hunting for eggs and candy, and I glanced down at Gavin wondering what we were going to do so he can have fun too in the years to come. It was one of those sad moments that just pops up without warning, but we are so grateful we have found the talking eggs. They are great for all little ones! I highly recommend them for visually impaired children, and for sighted children. All the kids had fun with them. Easter morning, he found his basket and all he cared about was the cellophane and grass. Sitting at church like a big boy, singing. And the egg hunt starts! Grabbing his basket to load it up. 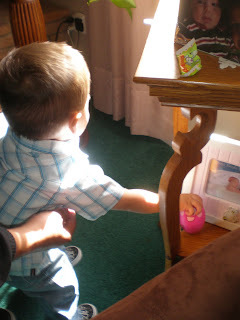 We took him to the general vicinity of the eggs, and he found them on his own. I was so proud!! Inside the eggs, you can also hide goodies. 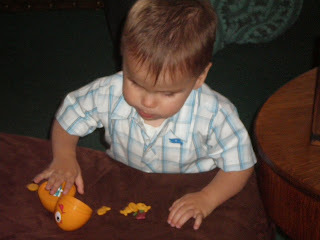 He opened his and is happily munching on his fishies. Group photo with all the cousins (well, most of them). Another group photo with Grandma Alice. ... and last but not least, my two handsome boys. 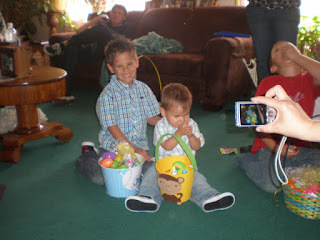 Hope everyone had a blessed Easter - we did! 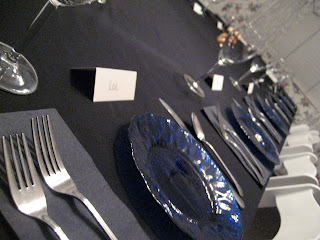 So busy trying to get the details together for this weekends Night without Light dinner. 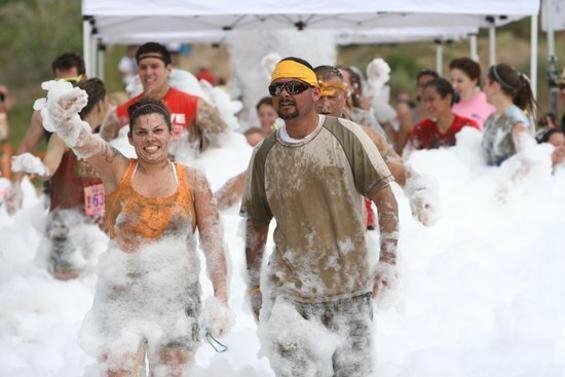 I did want to pop in and let everyone know we had an incredible weekend at the Irvine Lake Mud Run. It is hard for me to quickly describe it, other than ... wow! Thank you dearly to everyone who participated, and our bystanders who cheered on Gavin's Groupies, as well as our staff of family and friends who worked our booth, and our check in table, as well as Blend Media Solutions who covered the event for us. You rock! You can check out video/photos from the day by going here to our Hands Down Monkey website. We have so many events coming up, I wanted to do a post on all of the upcoming of Gavin's Groupies. We would love to have you involved! April 10 and 11. Irvine Lake Mud Run. Gavin's Groupies has 180+ people for Saturday's run. We have THE largest team. 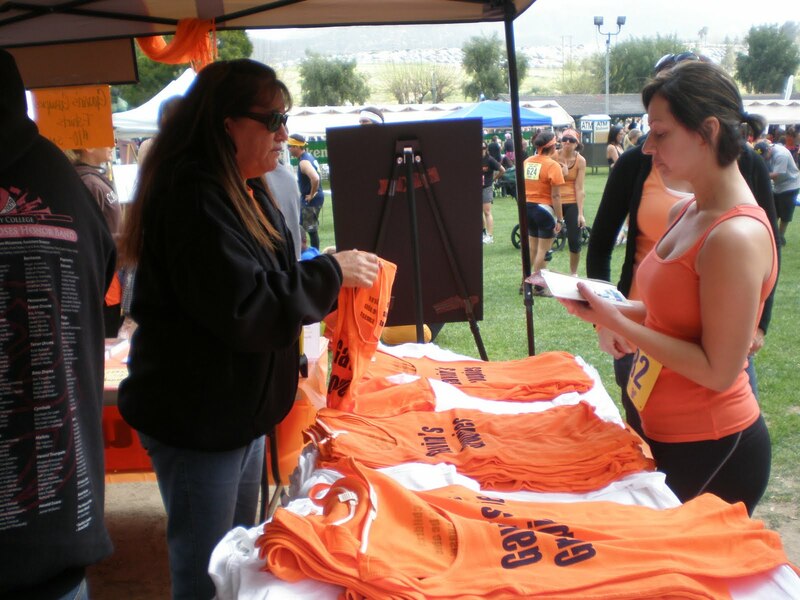 We will be having a booth where we will be giving out info for VisionWalk, selling Gavin's Groupies t-shirts and wristbands and talking to people about our mission. 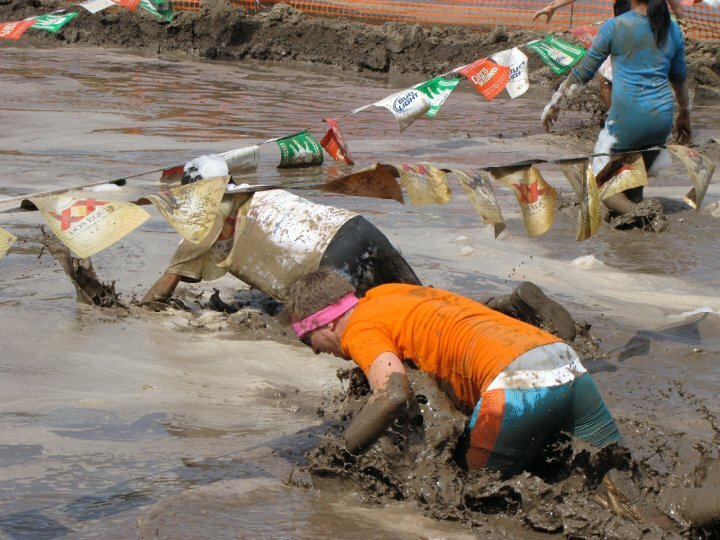 If you are not signed up to run, you can STILL come on down and see our team get dirty and visit our booth. It will be a great day. Parking is $5, entrance is free, but it is $15 to get into the beer garden/concert. Please click on the link for all the information. Friday, April 16th is booked, but we still have openings for Saturday and Sunday (the 17th and 18th). Due to demand, we have also opened up Friday, April 23rd. We are so excited to have a unique dining experience for all our donors to thank you for your support! Everyone is invited! This takes place at the Irvine Marriott Hotel. Free food! Please come if you can if you are a walker, sponsor, or volunteer. It is open to everyone who is supporting our cause. I will be one of the speakers at this event. This takes place at Cal State Fullerton. 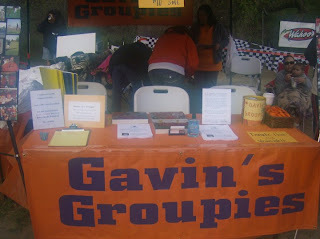 Please click on the link for more info on our team, Gavin's Groupies. To date we have raised over $1,000! I am the walk chair of this event, and would love for you to be involved. It's a casual walk, bring the family, your dogs, etc. There will be activities for the kids, Disc Dogs will be putting on a show, and it will be a lot of fun. Can't wait to see you! We have changed the course from last year, and you will love it. I think that is it so far... I will continue to add to the list. If you cannot make any of our events, but would like to donate, and be a Groupie, you can do so. The smallest dollar amount helps our cause, you can donate to our team Gavin's Groupies event page. We are still looking for sponsors, contact me for more info if your company would like to help. I am trying to reach everyone through all outlets possible. We are finalizing our details for the Night without Light. We almost have a packed house, but still some open seats for April 16, 17 and 18. Just 2 weeks away, and we are so excited! We are also looking into having an additional weekend to accommodate everyone. If you were thinking about attending, this is the time to let me know! Keep in mind, this is our family's way to thank you for your donation. Everyone who has donated at least $20 towards VisionWalk will be given a free ticket to A Night without Light. 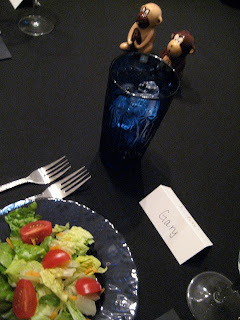 Please click here for more info on the dinner, and here is info on our team for VisionWalk 2010. Thank you everyone who is particpating, we are looking forward to seeing you in 2 weeks!! Below is the article and picture included in the Orange County's dinner journal of the Dining in the Dark event that took place in Newport Beach at the Fairmont Hotel. When Jennifer Stevens' newborn boy Gavin was just a day old and still in the hospital, her intuition was telling her that something wasn't quite right. Physically, he looked fine. He had all his fingers and toes, he was breathing well, and results from all of his tests were normal. The doctors said that little Gavin was doing very well. But something kept nagging at Jennifer. Her husband, Troy, chocked it up to the medication she was taking for pain. But after they brought Gavin home, Jennifer's fears continued to build. "Something just wasn't right and it seemed to be something with his eyes," recalls Jennifer, "When my older son, Landon, was born, he just stared at me. He was a very alert baby and looked around a lot. But Gavin wasn't doing that. When the Stevens brought Gavin in for his one-month check-up, the doctor said that sometimes the development of vision is a delayed process, and to just give Gavin another month to respond better. 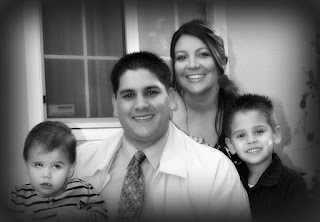 At the three-month check-up, the Stevens refused to accept that everything was fine with their little boy. Jennifer recalls, "By now, my husband started to pick up on what I was noticing, but the doctor said let's give it until the fourth month. Well, that didn't sit well for me. I was a mess. So, I called the doctor back and said I needed a referral to an eye specialist. To me something was definitely wrong, and I was in tears every day. I had this growing worry, and no one was listening to me." The Stevens then received a referral to a pediatric ophthalmologist, who determined immediately that something was absolutely not right. Gavin's pupils were responding, but not an the rate they should be, and upon further examination, the ophthalmologist identified atrophied areas on his retinas. The doctor called the situation with Gavin's eyes "dramatic." "I don't know what it is, " he reported, "but the atrophied areas are on the macula which is used for central vision. This is very detrimental to his vision." We left that appointment in tears with confirmation of everything that was nagging at me for the last three-and-a-half months," says Jennifer. "It obviously wasn't a relief to know that something was definitely wrong with my child, but it was a relief to know that we could start on a new path to figure out was was wrong." Two weeks later, Gavin was examined by Dr. Thomas Lee, a pediatric retina specialist at Children's Hospital of Los Angeles. Jennifer says that they felt very secure with Dr. Lee, because he sat down and explained everything to them. She recalls, "That was a defining moment, because we really got the chance to learn what was going on. 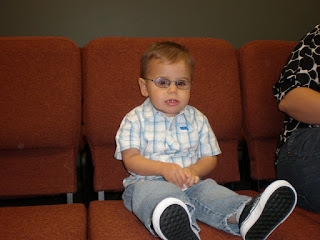 Dr. Lee characterized Gavin as having a retinal dystrophy, which was possibly Leber's Congenital Amaurosis. But he wanted to perform an ERG [electroretinogram] before confirming the diagnosis of LCA." 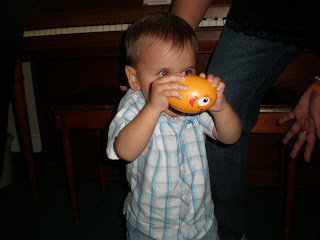 Finally in June 2009, when Gavin was eight was eight-months old, an ERG confirmed the LCA diagnosis. 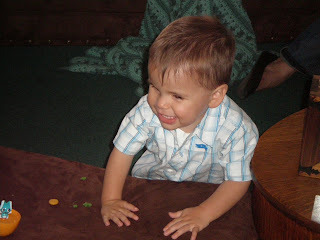 "Dr. Lee actually brought out the monitors and cameras and showed us pictures of Gavin's eyes. It was good for us to see what was going on - it helped us connect the dots. It had felt like we were on this emotional roller coaster with no real answers for the first eight months of his life," says Jennifer. 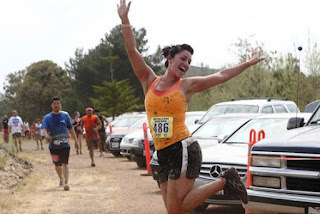 "To go from not knowing anything to having a little understanding was huge," says Jennifer. 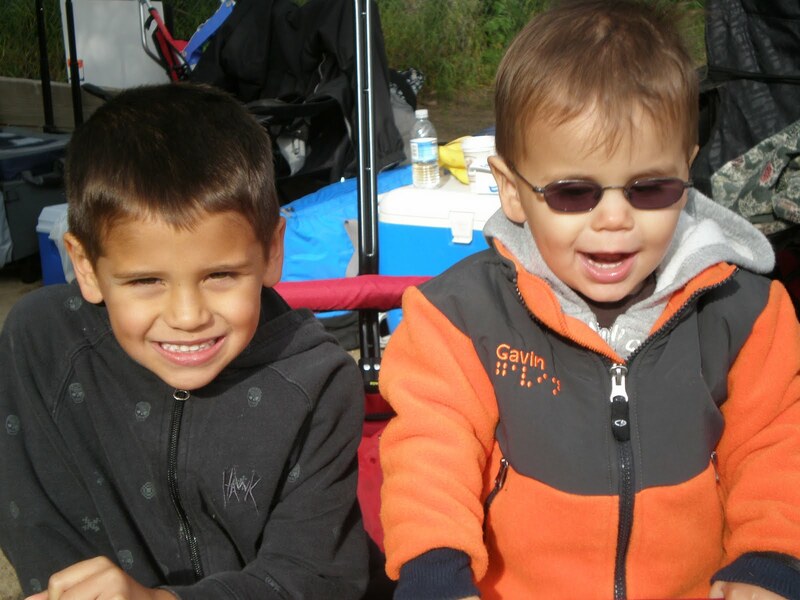 "Before, we didn't know if Gavin was sick or had a serious neurological disorder." Several months earlier, just after the Stevens took Gavin to the pediatric ophthalmologist, Jennifer started a blog to keep friends and relatives up-to-date on Gavin. She also came across the Foundation and organized a team Gavin's Groupies, for the 2009 Orange County VisionWalk. They raised close to $9,000. Jennifer says that getting involved with the Foundation was a major turning point for her. "Though it was very emotional for me, I felt that VisionWalk was the only way to make something positive out of the situation. It really turned into a great outlet for me as a mom. It was a saving grace." The Stevens also participated in the 2009 San Diego Dining in the Dark, which was another defining moment for them. "The reality of Gavin's situation was still very fresh in our minds, and when the lights went off, I lost it," remembers Jennifer. "But that was ok. I needed to get it out." 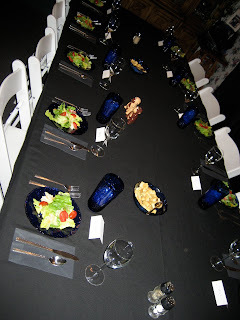 The family is now organizing their own version of Dining in the Dark, which they call A Night without Light. 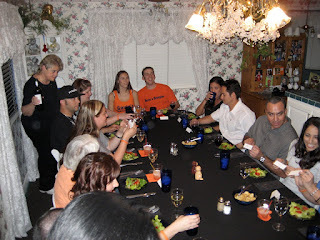 The idea came to them after having dessert in the dark during Thanksgiving at the home of Jennifer's grandma, Alice. Now they will be hosting Night without Light at grandma Alice's home in April for donors to Gavin's Groupies. In the meantime, 17-month-old Gavin, also lovingly known as Monkey, is a very happy, talkative boy, and quite the hip music aficionado. He knows several songs word-for-word including: "Say" by John Mayer and "How to Save a Life" by The Fray. "When he hears music, he will just stop whatever he is doing and focus on it," says Jennifer. "I've never seen anything like it in my life. It's soothing to him. Music is definitely going to be a big part of who he is." Gavin also enjoys puzzles and blocks, riding in his wagon, swinging on his swing, and horsing around with his older brother.